뿔쇠오리는 전라남도 구굴도 등지의 무인도에서 번식하는 희귀한 여름새이다. 태평양 동북부, 한국과 일본의 난류에 분포하며 특히 규슈와 이즈섬의 특산종이다. 사할린에서도 기록된바 있다. 몸길이는 약 20cm 정도이고 이마와 앞머리는 검은색이다. 등, 허리, 어깨깃은 잿빛이며 검은색 댕기가 있다. 폭넓은 검은색의 띠가 부리 기부에서 눈을 거쳐 멱까지 뻗어있다. 나머지 배는 전부 흰색이며 어깨에는 줄무늬가 없다. 도서의 해안이나 암초에 집단으로 번식하는데 암석과 암석 사이의 틈 또는 모래땅이나 초지의 땅 구멍을 둥지로 이용한다. 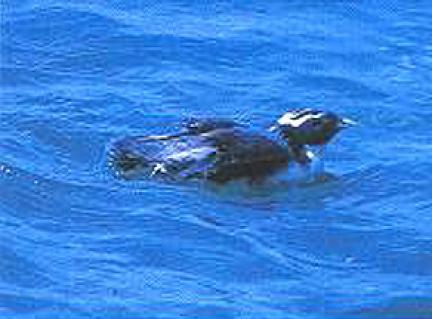 The crested murrelet (synthliboramphus wumizusume) is a rare summer bird that inhabits uninhabited islands such as Guguldo Island in Jeollanam-do. It is found in the warm waters of the Northeastern Pacific and around Korea and Japan, especially Kyushu and Izu Islands. It has also been sighted in Sakhalin. The bird is about 20cm long and is black at the front of the head and forehead. It has ash-colored back, trunk, and shoulders and black crest. A wide black strip runs from the beak to the nape. The belly is white, and there are no stripes on the shoulders. It inhabits islets and coastal reefs and nests in crevices and hollows between rocks or on sandy ground.